Indian Defence Minister Mr Pranab Muhkerjee assured the Tamil Nadu Politician Mr. Vaiko Monday that he will investigate the press reports on the reconstruction efforts of Palaly airstrip in the main Sri Lankan military base in Jaffna. “Earlier Indian political leaders had acted with great care, and had declined to enter into a defence treaty or airbase reconstruction projects when I have brought the Tamil concerns to the Indian leadership’s notice,” Vaiko said. 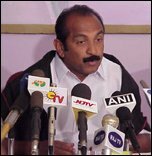 Sri Lanka was receiving financial aid from India and whether that aid was being poured into the airstrip project without the knowledge of the political leadership of India remains to be investigated, Mr. Vaiko said, adding that he strongly believed that India will not be trapped in Colombo's attempt to portray to the world that India was on its side of the conflict. The Defence Minister also assured Vaiko that the joint Naval excercise that begins Tuesday in Sri Lanka was en exercise India undertakes with many South asian countries except Pakistan. Mr Vaiko, the MDMK leader in TamilNadu state in India, when contacted by TamilNet Tuesday, said that he had called on India's Defence Minister Pranab Mukherjee Monday to convey his dismay over the reports that appeared in Colombo and Indian press that quoted Sri Lanka Air Force (SLAF) chief Donald Perera that Indian Government was providing financial assistance to the reconstruction of Palaly airstrip of the SLAF and that a team from India was expected to meet with Sri Lanka representatives to discuss the progress of the reconstruction work. Vaiko said he was closely following the recent developments in Sri Lanka and brought his concerns to his Defence Minister regarding attempts by Sri Lankan Government and its military leadership to show that India was on their side of the Tamil struggle. The publicity efforts intensified following the visit by the General Commanding of Officer (GOC) of the Southern Command of India, Lt. Gen. Takker on December 01 and another visit this week by Vice Admiral Suresh Mehta of Indian Eastern Command with a joint naval exercise, Vaiko told the Indian Defence Minister. The Naval exercises began Tuesday involving the Sri Lankan ships which were involved in NorthEast conflict, and the Indian ships INS Sukanya and INS Kirpan. Vaiko said that he had registered his strong objection already in October 2004 to a planned Indian involvement in the reconstruction of the Palaly runway for use by SLAF to conduct bombing campaign of Tamil areas. Referring to the International reactions including former Pope John Paul II following SLAF bombing of Navaly church that killed several hundred refugees, Vaiko said: "even a little help to Sri Lankan Military who has such a record and has intentions thrust a war on Tamils in Sri Lanka cannot be justified by any means even if Colombo plays the China and Pakistan cards to woo India into its fold". The Indian Premier is a stateman and is aware of the developments, Vaiko remarked. Vaiko said that he discussed the NorthEast Tamil issue in detail with the Indian Premier on November 28 and with the Defence Minister on 29th of November and added that he will be meeting them again before SL President Rajapakse's scheduled visit to India is to take place. "We are concerned and have reservations on the India rhetoric being played by the new President of Sri Lanka and his partners," he added. The Indian political leadership is also aware of the consequences of Colombo's strategy in sidelining Norwegian facilitators by overplaying an India-rhetoric, he added, praising the significance of Norwegian involvement in facilitation and the monitoring of Cease Fire between the parties in Sri Lanka. Vaiko will also meet the top politicians in New Delhi to convey his concerns regarding the Tamil people in Sri Lanka. "There are those who advocate that India should enter into a defence treaty with Sri Lanka based on the Chinese and Pakistani cards. But this will undermine Tamil interests. I have reminded them that the interests of Tamils who have a bond of brotherhood with Tamils in India are at stake here," he said. Colombo's moves displayed an approach that was adopted by the late Lankan President J. R. Jeyawardene in 1986 when he trapped India to act against the Tamils in Sri Lanka, an approach that distanced India from the Tamils in the Northeast, Vaiko said. The open rejection of the fundamental concept of the traditional homeland of Tamils in the Northeast is a sharp contradiction to the firm stand expressed by the Indian Prime Minister Mrs. Indira Gandi, he observed. "This was also one of the basic principles agreed in Thimpu," noted Vaiko. Stating that Rajapakse's stand expressed during the swearing-in ceremony, reflected the views advanced by his Sinhala extremist allies, the JVP and JHU, and favoured the Sinhala nationalist forces that sought to subjugate the Tamils in their traditional homeland for the past 50 years, Vaiko cautioned the Indian leadership on the pattern of Colombo's thinking, he said. The interpretration of the ground reality behind Lankan President's statement that anyone can settle anywhere in Sri Lanka needs to be viewed as an expression of the dangerous policy applied against the concept of traditional Tamil homeland, Vaiko observed. "This is an expression supportive of historically documented state-aided colonisations that have taken place in the Northeast with a clear agenda of depriving the basic Tamils' rights of the conterminous traditional homeland," he pointed out adding that the Indian leaders will not become pawns in the hands of Colombo. The reputation of Sinhala governments that have abrogated all the agreements reached between the representatives of Tamils and the Sri Lanka governments will be weighed heavily in any future Indian involvement, he said. "Look at what happened to the internationlly mediated humanitarian post-tsunami aid deal," he asked. When such an agreement of momentous humanitarian significance was blocked by the Judiciary of Sri Lanka as unconstitutional, what else are they willing to accede to the Tamils?, the Tamil Nadu politican asked. "I can see war clouds over the island. The keen interest being shown by Colombo to tilt the Indian stand in favour of their policy is a very dangerous ploy," he added. Indian Prime Minister Manmohan Singh and the Minister of Defence Pranav Muharjee, understanding the state of affairs, did not proceed with the scheduled signing of a Defence Pact worked out by the bureacracy of both the countries, Mr. Vaiko noted. He brought the Tamil concerns to the attention of the Indian Premier, Defence Minister when reports appeared in media suggesting the move to sign a Defence deal between the two countries. "Look at what is going in West Bank Jewish settlements, the whole world has witnessed that the policy of occupation of a traditional homeland with an agenda cannot be justified by any means if the conflict is to be resolved," he observed. Colombo, with a documented history of embarking on state-aided colonisation programme in the Tamil homeland, should deal with the Tamils in a constructive manner to resolve the conflict. Instead Colombo has opted to advance a policy that contradicts what was expected by India and the International Community, Vaiko said. 26.11.05 Eye of the storm? 25.11.05 Rajapakse rejects Tamil Homeland, Right to Self determinatio..